Our booths use professional, photo-lab quality dye sublimation printers that print in less than twenty seconds, including a clear protective coating and land completely dry. Our instant prints are archive quality and will be treasured in albums, wallets and on the fridge for years to come. 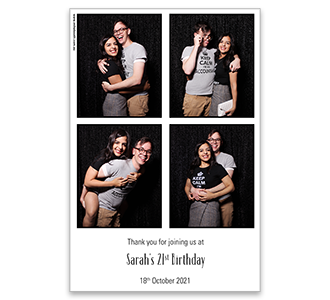 All images captured in our booths are supplied to the hirer in instant print format as well as each individual image in stunning, high resolution – ideal for post-event gifts and enlargements. In the Booth has three print styles for you to choose from for your booth prints; ‘Large Four Up’, ‘Traditional’ and ‘Traditional Logo’. The details of each of these print styles are listed below. The ‘Large Four Up’ print style consists of four images on a standard 6″ x 4″ (15cm x 10cm) print. It has a 4″ x 1″ (10cm x 3cm) space at the bottom for branding, text and/or logo customisation. This layout is especially popular for corporate events as the branding space is maximised. ‘Large Four Up’ contains only one single copy of each image and therefore is not recommended for events where a guest book is in use. The ‘Traditional’ print style consists of two identical, pre-cut strips of photos from the booth. Each individual strip measures 6″ x 2″ (15cm x 5cm) and contains four separate photos. The ‘Traditional’ print style does not have any space allocated for a custom logo or branding. The ‘Traditional Logo’ print style consists of two identical, pre-cut strips from the booth. Each individual strip measures 6″ x 2″ (15cm x 5cm) and contains three separate photos. In place of the fourth photo, there is a 3cm x 5cm space available for branding, text and/or logo customisation. We have a wide range of print template themes available to dress up your ‘Large Four Up’ and ‘Traditional Logo’ print styles. 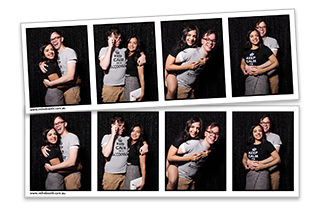 These add that extra ‘wow’ factor to your prints and ensures the theme of your event is incorporated into your photos to create the ideal gift for your guests. Once your booking is confirmed with In the Booth, you will be able to choose from our extensive print template range that are all completely customisable with your choice of wording. If you have something special in mind we can design something specifically for your event, guided by your specifications. Our in-house designer will work with you to create an original design especially for your event. Perhaps you would like to incorporate an illustration used on your wedding invitations. Our corporate clients often include their event branding and company logo for extra market retention. Whatever your needs, we look forward to working with you to create the perfect design for your event!